Birmingham’s BE FESTIVAL takes place every summer for a week long shindig and in its nine years has become a respected and reputed UK home for European theatre, dance and circus and often beautiful, hilarious and downright bizarre variations of the above. BE stands for Birmingham European and it takes place at The REP, with the main stage programme showcasing up to four pieces every night. 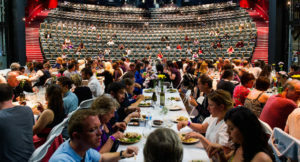 Brilliantly, audiences and actors eat together on the main stage of the theatre at half time. There’s a whole heap of other stuff happening from visual arts to live music and the social, dancing and beverage centre is the Hub where you can chill on chaise longues and enjoy installations often derivative of the specific theme of the year always connected to the festival’s European identity. Here are some show’s that we recommend seeing this year. But truth is, the shows that you least expect to enjoy are the ones that you’ll never forget. Hyperconnectivity is a modern phenomena derived from our ever-evolving, networked and digital world. As increased reliance on electronic communications weighs on our day-to-day existence, our sense of perspective can distort, leading to profound consequences for our state of mind and relationships at home, work and online. Colectivo Fango’s eye-popping trip into the digitally interrupted mindset poses an array of questions about the negative effects of technology. The company’s mission is to pursue and relate to human identity, often with uncomfortable results. In March F.O.M.O completed a month long run at Madrid’s national theatre, Teatro María Guerrero. Contemporary dance is often denigrated and accused of being self righteous, impenetrable even, begging the question how can it be explained? With tongue firmly in cheek, director Petra Tejnorová (with a cast of five) takes charge in writing the ‘manual for anxious audiences’ offering guidance about how to overcome your ‘contemporary’ fears. Emblazoned with irony, the show plays with the audience whether on the fence or initiated. VerTeDance were created in 2004 in Prague and with previous work Correction, they won the 2015 BE FESTIVAL audience award. Violence permeates all areas of human existence, from the micro to the macro and is often closer to home than we care to admit. 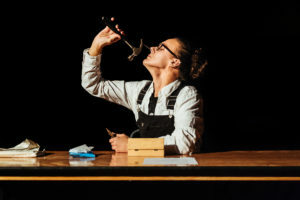 Five performers – using movement, dance, sound and text – discover how acts of physical aggression and the escalation of violence can both disturb and stimulate us. In doing so, they ask questions about our paradox boundaries between stage and the real world and challenge the notion of the theatre as a protected space. Billinger and Schulz create challenging tense work where society and the public are conceptually central and the body is the chief narrative tool. Tickets for BE FESTIVAL are available via the REP’s website. Week long or day passes.